About a week after I had finished my Corner Template Storage Box, I was walking past where I’d left it in the kitchen and noticed that the lid wasn’t on properly. I assumed that someone had looked at it and hadn’t put the templates back in properly. I rearranged the contents several times and tried fitting the lid different ways, puzzled as to why the lid would not close fully on one side. 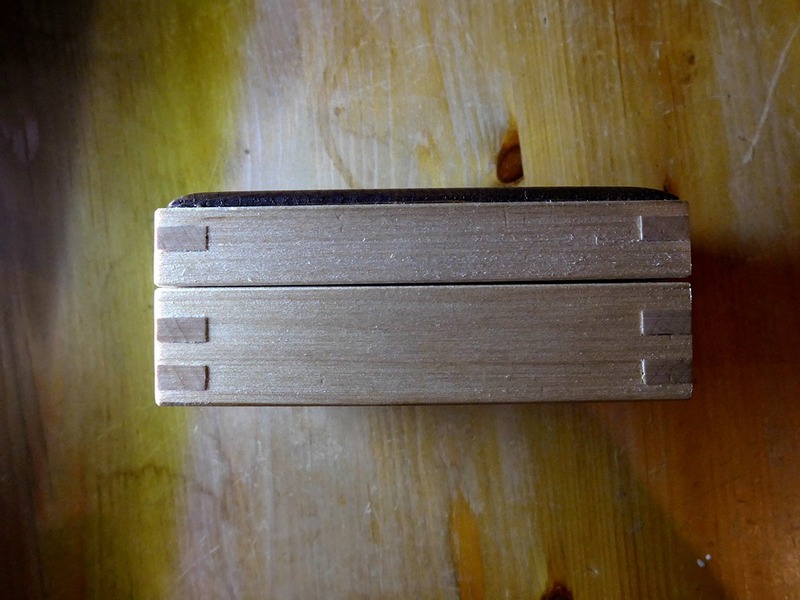 The sides of the box had reduced in thickness causing the fingers to stick out slightly. Also the wood would have shrunk in the other dimension causing a reduction in the height of the box. So now it was obvious why the lid didn’t fit when the box was full. I must have made it to such tight tolerance that the box was now no longer deep enough to hold the templates. Note that shrinkage of wood along it’s length is almost imperceptible at this scale and is rarely an issue even on much larger pieces. 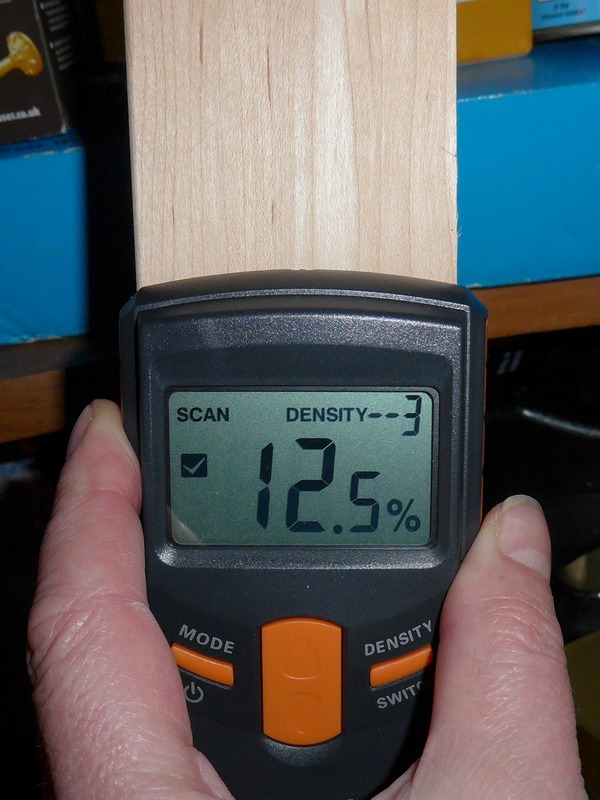 Using a digital dial gauge I measured the amount by which the box-joint fingers were protruding. They were proud of the surface by 0.14 mm or roughly 5 thousandths of an inch. Even though I had a dehumidifier in the workshop, it was obviously not as dry there as it was in the warmth of the house. Luckily, for the sake of ‘controlled’ testing, I still had pieces of the same Maple stock that was used to make the box both in the workshop and in the house. 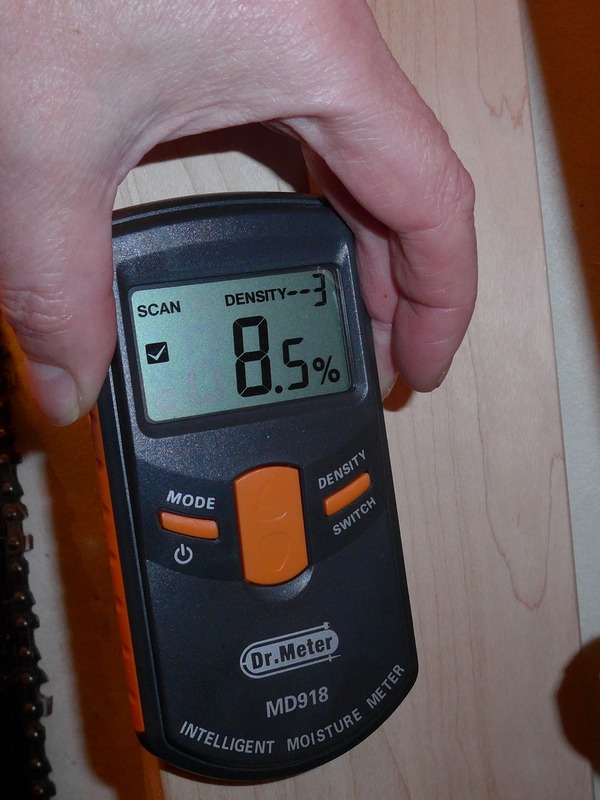 The maple that had been in the house for over a year measured 8.5% moisture content. … whereas maple from the same batch that had been in the workshop for over a year measured 12.5%. 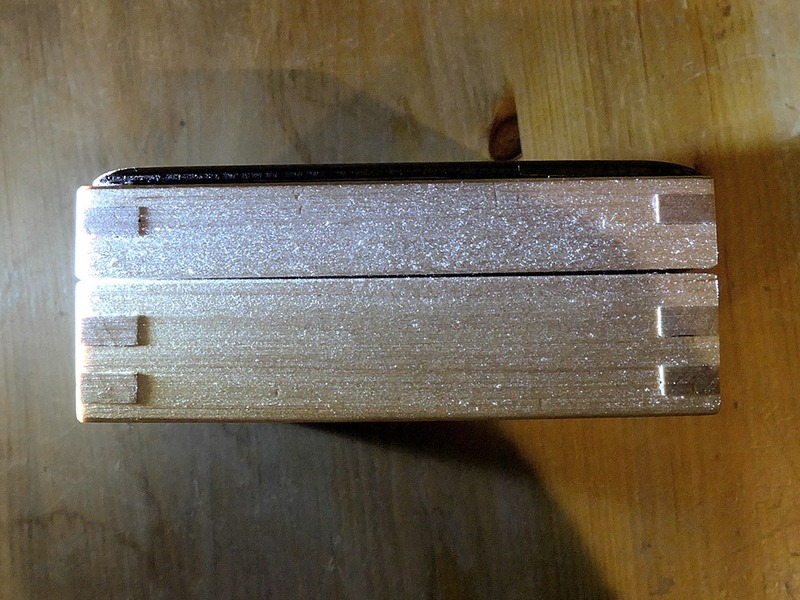 Furthermore I measured the width of the accurately machined boards and found that those which had been stored in the house were roughly 1 mm narrower that the ones from the workshop (60.3 mm compared with 61.3 mm). It didn’t worry me too much because it is intended that the box will be kept in the workshop, and when I take it back there it should theoretically return to its original size after a week or so. You should always make projects from wood that has been kept for several weeks in the place in which the item is intended to be used, so in fact I had done the right thing. However, I shouldn’t have made the box such a close fit and should have allowed room for some shrinkage, because even the workshop will become a drier environment in the Summer. Although I’m always aware, when designing projects, of the effects of wood movement, it’s always a good reminder to see it in action. Had it been the Summer, this movement may not have occurred because the house would not have been much drier than the workshop. The box had been left in the kitchen, where the relative humidity was 25% – about the same as the Sahara Dessert! Elsewhere in the house it would have been drier still. Kitchens benefit from kettles boiling, cooking, washing-up – all helping to put moisture in the air. Homes in the Winter are very dry because cold dry air from the outside gets heated by the central heating (or whatever), and in the absence of any extra moisture being added to the air, the relative humidity decreases. This has been a good reminder that wood is a dynamic medium that continually responds to its changing environment. Metalworkers have it far easier! Addendum: I took the box back to the workshop, where it was going to be used anyway, and in less than a week it had restored to its original size, as built. The lid now fits flush again. It could of course shrink again in the dry Summer months. I should modify it to give more clearance inside. 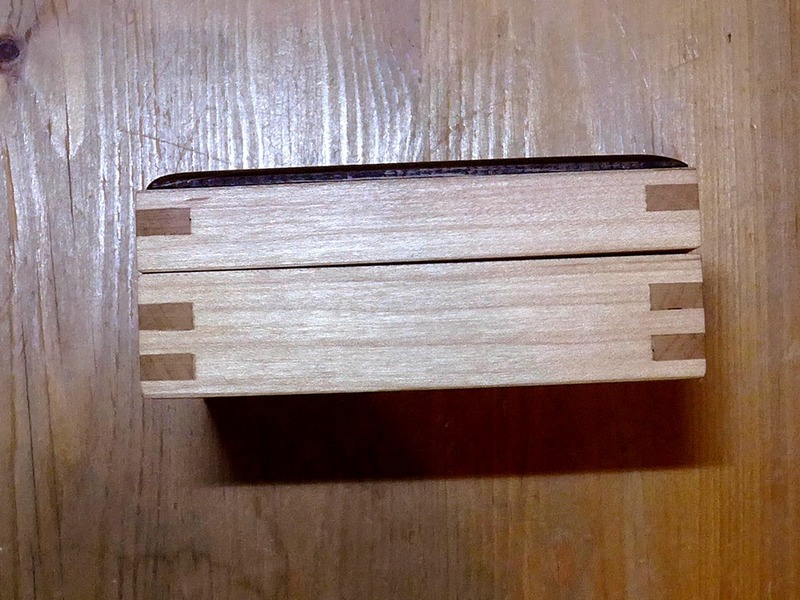 In future I shouldn’t build a box with such a narrow tolerance of the internal depth. This was actually more by chance than intention. It’s important to keep wood for a couple of weeks near the intended location of the finished piece so that it can acclimatise to the conditions before it is machined to final dimensions. It’s still imperative that design considerations are made that take into account that wood moves significantly when exposed to the different conditions experienced in these climes over the course of a year. Elsewhere in the world, or with air-conditioning, it may be the case that humidity levels are completely stable in which case the issue of wood movement is far less serious.